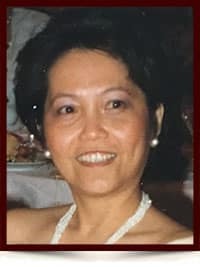 Erlinda (Orquiola) Espinosa - Edmonton's Burial & Cremation Professionals | Trinity Funeral Home Ltd.
Erlinda (Orquiola) Espinosa of Edmonton (Ate Linda), born in Sto. Cristo, Tarlac Tarlac, Philippines, passed away unexpectedly on August 23, 2016. Erlinda will be sorely missed by her husband Gunter Schaarschmidt; sisters Georgina Crouch and husband Mike, Ores Ting, Fraulein Guiam and husband Ronnie; brother Antonio Espinosa and wife Ligaya; and all of Ate Linda’s beloved nieces and nephews, i.e., Leane, Mariel, Alexandria; Richard, Myles, and Quinton. Erlinda was predeceased by her parents Felicidad and Gregorio Espinosa. 10530 116 Street, Edmonton, AB, T5H 3L7. In lieu of flowers, donations can be made to The Canadian Diabetes Association in Erlinda’s name. I worked with Erlinda for a number of years. She was always a passionate advocate of her coworkers and was a giving person in many aspects. Please accept my deepest sympathy and condolences at this very difficult time. I was very sorry to hear of Erlinda’s passing. I was a co-worker and Erlinda was always supportive and openly shared her knowledge of the Canadian Tax Act with co-workers. She sat at the work station next to me for approximately three years until she retired. She was a union steward for the union and was a strong advocate for employees that were mistreated by management and fought for employee rights. She represented me on one occasion and was very dedicated to her union steward activities. Erlinda was a strong advocate for workplace equity and fairness. I offer my sincere condolences, and have missed her since she retired.